Malika Arora to share a cup of 'Koffee' With Karan? Right after Bollywood filmmaker Karan Johar unveiled his pictures from the sets of 'Koffee with Karan' where he struck a pose with Aamir Khan, he was also spotted posing with Bollywood diva Malaika Arora in a few other pictures. 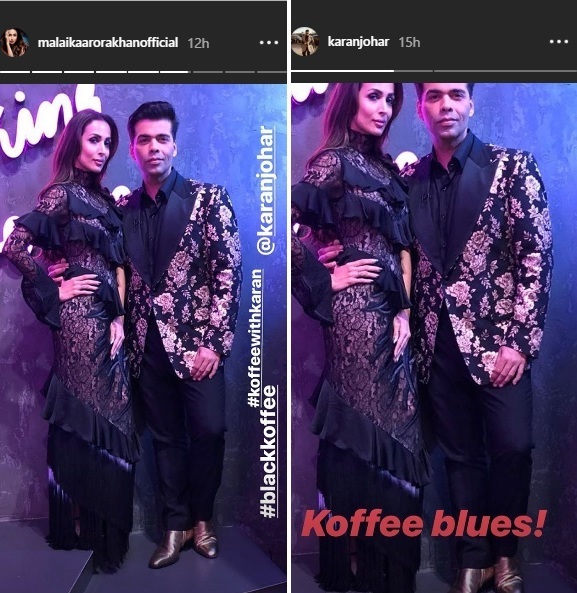 Both, Malaika and Karan took to their Instagram handles to share a few inside pictures from the sets of 'Koffee With Karan'. She captioned: "Twinning n winning @karanjohar #koffeewithkaran... loved being master of u n @_aamirkhan. thank u for makin me feel so so special". KJo shared a picture of Aamir Khan and in his caption revealed that Malaika was the master and the judge of the Rapid fire round that he played with Aamir. His caption read: "@_aamirkhan in the koffee house!!!!! #koffeewithkaran@starworldindia @hotstar!! Some crazy banter and I played the raps fire with him!!! @malaikaarorakhanofficial was the master and the judge of that round!!!". Karan Johar is known to bring many sparkling stars on his show, which only he could accomplish. Notable actors Janhvi Kapoor, Arjun Kapoor, Sara Ali Khan, Saif Ali Khan, Alia Bhatt, Deepika Padukone, and many remarkable stars are done shooting for the filmmaker's show.